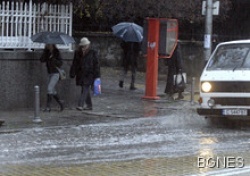 A total of 25 signals for floods have been received by Bulgaria's Civil Defense early on Saturday. "Code Orange", the second highest in the natural disaster danger ranking, has been declared in 14 municipalities across the country. The continuing heavy rain, mainly in the region in the capital of Sofia, has failed to cause any major damage. In some municipalities, in which the drains have not been maintained regularly, some problems have occurred. A part of Sofia's major ring-road has also suffered from flooding, but the traffic has not been fully blocked. The floods have been far more severe in the Western Balkans, with thousands being evacuated in Serbia, Croatia and Bosnia amidst flooding rains. Bulgaria is going through some bizarre weather conditions recently, with record-high temperatures being registered once again on Friday. Meanwhile, the extremely cold weather in Western Europe has already taken victims and has disrupted the air, road and railway transport.